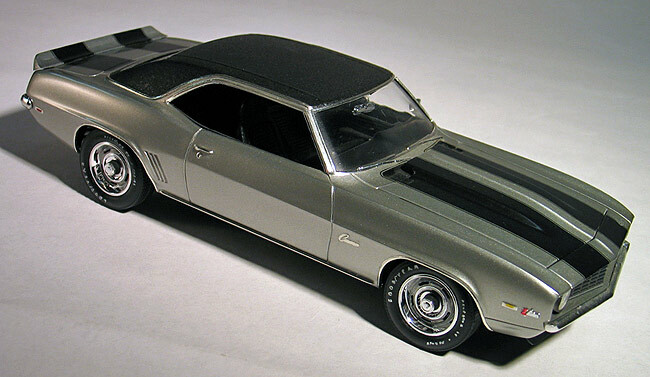 I built this Revell 1969 Chevy Camaro Z-28 kit right after it was introduced in 1992 and it ranks as one of my all time favorite model kits. I think Revell just nailed all the proportions of the body and it builds up to a great looking finished model. I wanted to build a simple stock Z-28 but I usually try to do something a little different then just build what comes in the box. So, I decided to try and replicate the factory vinyl top option. 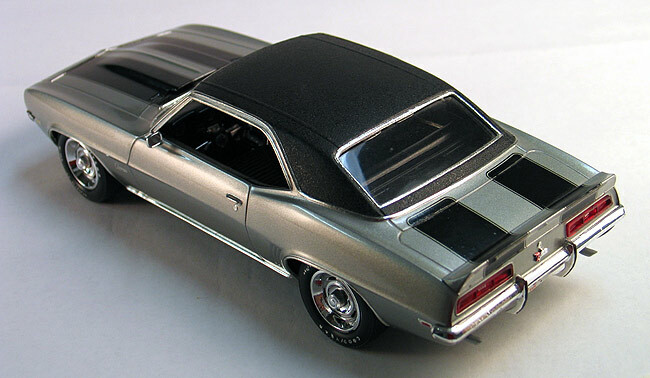 The '69 Camaro has a very complex vinyl roof treatment because of the chrome trim strips that passed over the top of the side windows. First, thin Evergreen plastic strips were glued to the body to create the roof trim. I then added two very thin strips of masking tape to the roof to create the vinyl seams. Then after the car was painted body color I masked the body and painted it with a combination of flat and gloss blacks spray paints held at a distance.The black paint was misted on in "dust coats" to achieve a realistic scale texture.The silver paint itself is Duplicolor touch up spray with a Duplicolor clear overcoat, both shot from the can. The only other modification I made was to open up the front grill by grinding down the backside with a Dremel. The rest of the kit was built straight from the box. Revell has done multiple versions of this kit and some day I hope to build them all.